On Monday night, Mercy Ministries Nashville hosted over 60 volunteers from the Middle Tennessee community at our first ever Volunteer Orientation. The orientation provided the interested people with information about ways they can give their time, gifts and talents to support Mercy Ministries. At the orientation, volunteers discussed upcoming events for 2009 and volunteer opportunities on an ongoing basis. The highlight of the night was when two Mercy graduates shared their testimonies with all of the guests. They explained how God’s unconditional love and life-transforming power helped them overcome their life-controlling issues while they were in the program and encouraged volunteers that their involvement makes a difference. We would like to thank our neighborhood Papa John’s Pizza for donating the pizzas to our Volunteer Orientation. We would also like to thank all of the Nashville supporters that came to the Volunteer Orientation. We look forward to working with you in the future - your time and support is greatly appreciated! And we have room for others who want to help! 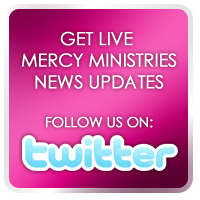 If you are interested in volunteer opportunities in your area, please e-mail volunteer@mercyministries.com.